For fastening accelerometers with glue two methods can be used. One method uses direct fastening of accelerometer with sticky layer and the other one uses a special pin with a base fixed with glue on surface of a sample under test. Make sure that the object surface is flat and clean in the accelerometer fastening place. Otherwise, treatment and cleaning is required. The accelerometer base must also be cleaned. 2. Attach the accelerometer to the surface of the object under test with quick-setting cyanoacrylate glue. Mind the instructions of the glue’s manufacturer during fastening the accelerometer. 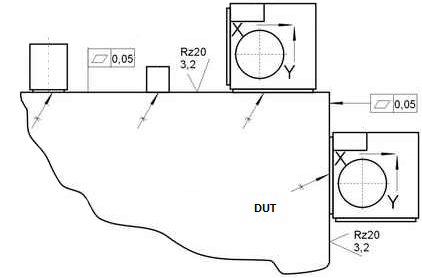 This method is widely used for fastening small, compact and super compact accelerometers. Used to fasten accelerometers for stationary control and monitoring of mechanical fluctuations, which do not allow fastening with pins or screws. Direct fastening with glue does not impair its operating frequency and dynamic range. — Disconnection of the accelerometer fixed with glue is difficult. — During repeated gluing, it’s hard to find the absolutely identical location of the accelerometer. — Electric isolation of the accelerometer fixed with glue is complex and difficult. Cyanoacrylate glue can be used only for direct fastening of accelerometers to completely flat and smooth surfaces. During the gluing, surface roughness of the object under test must be not worse than Rz20, non-flatness – not more than 0.05 mm. For gluing vibration transducers, epoxy or other glues can be used. At the same time, it is reasonable to control gluing on check samples. During laboratory tests, it is allowed to use glues, adhesive tape, or wax mastic. During the gluing, banking of the vibration transducer body is allowed. Note that in case of glue fastening, mounting surface of vibration transducer and the object under test must be thoroughly degreased.